Two apartments side by side, a city, a man and a woman entrenched in their routines they linger in loneliness. Parallel lives, infinite possibilities, a chance encounter. Within their strictly organised routine, the characters stumble onto the echoes and memories of this encounter. Guide to their memory, a map on the floor – a pathway that could lead them back to the ecstasy of that one moment. 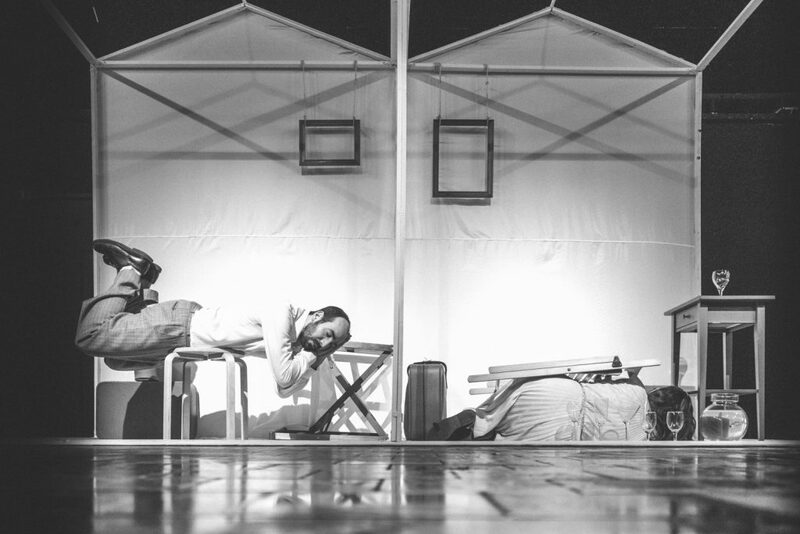 “A day and A year-and-a-half” is a piece about routine, isolation, loneliness and the yearning for companionship, and combines minimalistic choreographies, music, audio recordings as well as descriptive and poetic language in English and Greek. The poetic synthesis of movement, sound, scenography and text, blurs the boundaries between reality and imagination creating a mercurial repetition that references reality. “A day and A year-and-a-half” is a performance by Eilon Morris and Zoe Katsilerou, inspired by Jimmy Liao’s short story “A Chance of Sunshine”. It premiered in Glasgow in September 2016 and was re-worked as a bilingual piece in Thessaloniki, Greece January 2017.